Size of this preview: 762 × 600 pixels. Other resolutions: 305 × 240 pixels | 1,705 × 1,342 pixels. Description: Shamanism is a very general (sometimes even debated) concept, comprising mediator-role figures of several different cultures, with great diversity. That is why this image is a tableau. 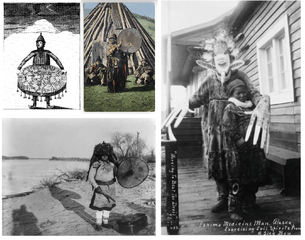 It is created to be a lead image of Wikipedia's Shamanism article. Credit: The montage is made with GIMP out of the four Wikimedia Commons images: , licensed PD-old , licensed PD-old , licensed PD-old , licensed PD-US Thus, one of the member images is licensed more restrictively (PD-US) than the others (PD-old). This most restrictive licensing (PD-US) is given to the resulting montage. Author: GIMPed together by Physis. The descriptions of the "member images" can be seen at their own description pages. Three of them are licensed in public domain because of being old, but one of them is licensed in a more restrictive way (public domain in the U.S.A.), thus, this is chosen to form the license of the resulting montage. Permission: This image is available from the United States Library of Congress's Prints and Photographs division under the digital ID cph.3b25870. This tag does not indicate the copyright status of the attached work. A normal copyright tag is still required. See Commons:Licensing for more information. العربية | čeština | Deutsch | English | español | فارسی | suomi | français | magyar | italiano | македонски | മലയാളം | Nederlands | polski | português | русский | slovenčina | slovenščina | Türkçe | українська | 中文 | 中文（简体）‎ | 中文（繁體）‎ | +/− This media file is in the public domain in the United States. This applies to U.S. works where the copyright has expired, often because its first publication occurred prior to January 1, 1923. See this page for further explanation. This image might not be in the public domain outside of the United States; this especially applies in the countries and areas that do not apply the rule of the shorter term for US works, such as Canada, Mainland China (not Hong Kong or Macao), Germany, Mexico, and Switzerland. The creator and year of publication are essential information and must be provided. See Wikipedia:Public domain and Wikipedia:Copyrights for more details. This work is in the public domain in its country of origin and other countries and areas where the copyright term is the author's life plus 70 years or less. You must also include a United States public domain tag to indicate why this work is in the public domain in the United States. Note that a few countries have copyright terms longer than 70 years: Mexico has 100 years, Jamaica has 95 years, Colombia has 80 years, and Guatemala and Samoa have 75 years. This image may not be in the public domain in these countries, which moreover do not implement the rule of the shorter term. Côte d'Ivoire has a general copyright term of 99 years and Honduras has 75 years, but they do implement the rule of the shorter term. Copyright may extend on works created by French who died for France in World War II (more information), Russians who served in the Eastern Front of World War II (known as the Great Patriotic War in Russia) and posthumously rehabilitated victims of Soviet repressions (more information). This file has been identified as being free of known restrictions under copyright law, including all related and neighboring rights. This page was last modified on 20 April 2017, at 10:28.